My experiences, both the good and the bad, during my expat adventure in Singapore. 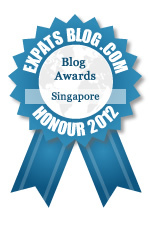 ExpatsBlog.com Expat Blog Awards 2012: Singapore Honourable Mention Award! This blog won the Honourable Mention Award for best expat blog in Singapore! I vote for Laura's blog as I read it all the time and find it fascinating to learn about Laura's adventures whilst in Singapore. I vote for Laura's blog. I have been following Laura's blog since it started. She has covered moving from the UK to Singapore, the sights of Singapore, good places to eat and visit and these are always well written and interesting. I read and contribute to this excellent blog, gets my biased vote every time. Awesome and informative blog which I use for deciding where to eat and drink in Singapore.